EDIT: Thanks to Dsauns for noticing the emblem I missed from CoS. The post has been editted appropriately. I have also moved the route around slightly. I believe this new route can’t be beaten. I have also editted the Emblem totals as the drops from the normal version of the new dungeon and the dailies has changed. EDIT: Just seen the feature on WoW.com! I’ve had a few comments regarding the Oculus and after checking it does indeed drop 4 emblems instead of 3, so I have editted the post accordingly. As promised yesterday, here is my post on what I believe to be the quickest way around Northrend to pick up the full amount of Emblems. I realised that in my post yesterday I made a slight mistake in saying that the amount of Emblems available from Heroics is 47. I completely forgot to take into account the Emblems available from the Trial of the Crusader (the new 5 man, doh!) and also miscounted elsewhere, so I believe the figure to be at 54. The Heroic version will drop 3. Let’s begin! This is the map I’ll be using (a larger version can be found here). The basic premise for this is to have the most efficient route possible. The problem however is that many places; such as Coldara and Utgarde Keep, are well out of the way. This in my opinion is one of the quickest routes to get around, so let’s break it down. We should start off by travelling back in time to the Culling of Stratholme and should go there from Dalaran. Doing this means that we can hearth back to Dalaran afterwards to allow our Hearth Stone time to come off cooldown sooner. If you are in a good group, getting 5 Emblems here shouldn’t be a problem, otherwise you might have to settle with 4 Emblems if you can’t pull off the timed run. Once you’ve finished forcing Mal’ganis into submission, it’s time to go back to Dalaran for Violet Hold. It’s a relatively easy Heroic and will allow you to get 3 more Emblems without too much hassle. Once done, you should be up to 8 emblems in total! After CoS and the Violet Hold, just take a quick trip over to visit the Nerubians at Ahn’kahet and Azjol Nerub. Azjol Nerub is by far the easiest of the two (did a very quick 11 minute run of it recently) and will bag you 3 easy emblems. Once you’re done with Azjol Nerub, Ahn’kahet is just next door. It is one of the harder Heroics in Wrath, but there are 5 more Emblems up for grabs, along with a 22g Daily quest for the place. Another 8 emblems added to the total brings you up to 16 already! Good job! After dealing with the Nerubians, it’s time to head over to Coldara and get The Nexus and Oculus out of the way. The Oculus is one of the most irritatingly annoying Heroics at the moment, but with the drakes adjusting with your average iLevel, it should be a bit less annoying next patch. The Oculus will give you the next 4. The Nexus is just down stairs from the Oculus and will bag you an easy 5 emblems, bringing your total up to 25. It’s now time to hearth back to Dalaran to stock up on ammo, food and reagents before setting off to prove your worth at the Coliseum. Once you’re done stocking up and repairing, head over to the Tournament Grounds in Icecrown. Here you can run the Trial of the Crusader in Heroic mode bagging yourself 3 Emblems giving you another 3. This takes you to 28. From here just fly on over to Stormpeaks to traverse both the Halls. Completing the Halls of Stone will give you 4 Emblems to start with. I personally don’t like the Halls of Stone as it was one of my first Heroics. Nothing quite sets you up for hating an instance more than trying for difficult achievements whilst being severly undergeared. Maybe it’s just me, I’m sure someone out there loves the place. Anyway, Halls of Lightning will also give you another 4, bringing the total up to 36. Not too shabby! After the Halls, you have the oppurtunity to repair again with the vendors just outside the instance entrances. Once you’re done filling your bags with ammo (I feel I’ve mentioned this before…), head on over to Gundrak. This is another fairly easy Heroic; even if the last boss can be a little unpredictable, you can get another 5 Emblems. It’s well worth going out of the way for it as it takes the total up to 41! From here it’s a short journey over to Drak Tharon Keep. This is another instance I love but I also hate. I love it because it is so easy and the bosses are a little different, but I also hate it for the fact the King Dred just didn’t drop that trinket when I needed it. Even though the place is so easy, you’ll still be awarded 4 Emblems. This takes us up to 45 in total. Now it’s time for the last trip of the journey, down into the depths of the Howling Fjord. Here are another two instances for you to milk for Emblems. The first should be Utgarde Keep itself as it’s the easiest of the two. It’s a fairly straightforward Heroic and I know I’ve run the place in well under 20 minutes. This gives you another 3 Emblems. Finally we have Utgarde Pinnacle, regarded as one of the harder Heroics, even giving you an oppurtunity to leave with a shiny Proto Drake. Even still, persistance should let you get another 4 Emblems. This will bring your daily total up to 54! The Normal Daily also rewards another Emblem, bringing your final total to 54! From a full days instancing, you can bag yourself 54 Emblems of Conquest, just short of a shiny piece of Tier 8.5. Also doing all the Heroics should also bag you 2 Emblems of Triumph from the Heroic instance daily. If you keep this up for a few days, you’ll be geared enough to play with the big boys… and you’ll be in need of some time away from your computer. CoS timed drops 5 emblems, not 4. unless theres a change in 3.2, but currently all the bosses drop emblems. If you don’t make the timed run you only get 4, if you make the timed run and kill the extra boss, you get 5. Good guide. Of course you have to factor in “Additional instances cannot be launched”. Which may mean you have to have a strategy to spread out to find the instance that will launch. And yes, even though the instances may be on the same server, it seems that there is a limit to how many of a certain instance can be launched at one time. I was also under the impression that the Oculus dropped 4 emblems… unless one of the bosses doesn’t drop one. Very interesting concept. Might try to put a group together for it tomorrow if we don’t get a raid going. Don’t the daily heroics give 2 Emblems of Triumph and not an EoC? The new Emblems of Triumph are not tradable for either Emblems of Conquest,Emblems of Valor or Emblems of Heroism. I checked at the Quartermaster. Then again if you do the daily hc for about 15days(if you only get 2)you can buy better gear so why bother trading. Actually u can turn Emblem of triumph to conquest a goblin vendor in near the underbelly innkeeper named Usuri Brightcoin has them. Any way we can get some average times on each of these runs? Take an enchanter with you for high volumes of abyss crystals! Man, there should be achievement for iron-manning all 5-man content in one 24-hour lockout. If you had the time after all that and you have the people… the 10 man and 25 man run thru Naxx will give you alot more Emblems. Thats awesome sent this link to my buddies thanks bud! The timings on WoW-wiki suggest that your run will take about 15 hours! I know there’s time that can be shaved off that if everyone involved knows what they’re doing, but even so, it’s a pretty serious day’s work! You’ll need five runs to gather all the available T8 stuff, and if you wanted to get a full gear set by downgrading, it takes it up to 11. 11 days of 12-15hrs raiding. That’s some fairly intensive farming! I managed to bang out 11 heroics with a changing pick up group in less than 11 hours and that included some waiting between runs while we looked for a new healer. The only reason we stopped was that it got so late at night that we could no longer find warm bodies to fill pug slots. Included in the 11 was a heroic Oculus (one of the longer more annoying heroics) at the beginning with a wipe on the last boss and a successful CoS timed run. We ran with a two-tank pally and dk combo and found that it allowed us to chain pull or even double trash pulls, making the runs a little faster. It also made for less accidental dps deaths from people not watching their aggro and zero boss wipes, except Oculus. A few times, while we were trying to pug a fifth person to fill a dps slot, we 4-manned the trash clears up to the first boss. This also makes for less overall downtime. Good thinking, but with the current state of instance servers, the outcome would be 6 emblems and 2543 “Additional instances cannot be launched” during a typical day. I managed to bang out all heroic instances and even had time for OS10, OS25, VoA10, VoA25 and 3 quarters of naxx 10 yesterday before server maintanance. Sadly i didnt know about this route so we was going where ever the rest of the team wanted to go. I had to grab some other guildies to fill spots when some1 had to go or was saved to one. Take a mage with you for a portal to Dalaran,someone with a Traveler’s Tundra Mammoth or a repair bot(engineering) to cut some time aswell,paladin for the kickass buffs,and make sure everyone knows what they’re doing,have flight paths or epic flying mount,now. 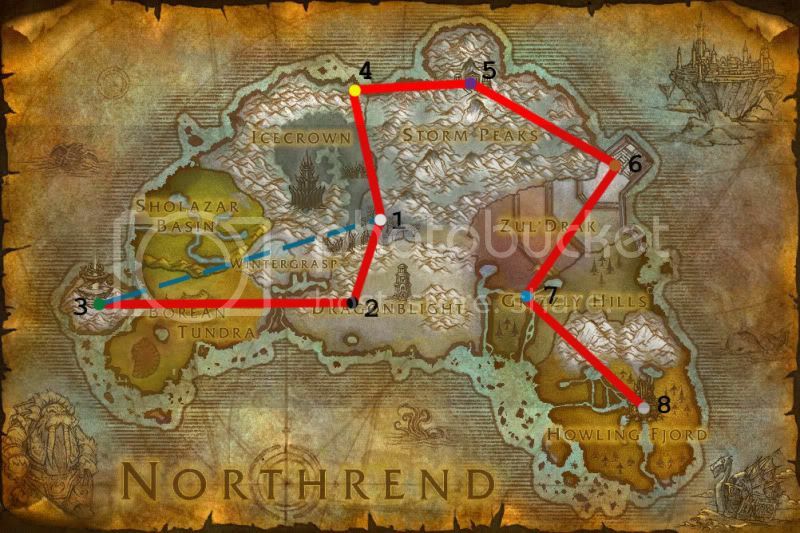 I’d start at the Nexus,after that go to the Pit of Narjun,then Dalaran,VH first,then CoS,here’s where the mage comes in,basically when it ends,you’re still in Tanaris,which blows you off the map,other than having your Hearthstones set to Dalaran,the mage can port you,yet,no mage is online on the entire WoW,set your Hearthstones to The Argent Tournament Grounds,that way you cut out 5-10minutes going to it from Dalaran,and then follow the rest of your route,so you fly in 1sweep instead of turning back once,cuts a piece of time,this may narrow it down from 11-15 hours to 8-12 hours,since the repair bot is exhebitioned inside the instance or right at the entrance so no need to stop by a city or a village to repair. For those who prefer Utgarde over Nexus,do that first and go the other way around,it’s basically the same but it’s better to start at the one you like the most so you don’t get bored after the one run. blog’s post to be updated on a regular basis. It contains pleasant information. It’s on a entirely different topic but it has pretty much the same page layout and design. Excellent choice of colors!